As SpaceX's first crew-carrying vehicle wraps up its maiden test flight to the International Space Station (ISS), Boeing is prepping for its own moment in the sun. SpaceX's Crew Dragon capsule launched early Saturday morning (March 2) on an uncrewed shakeout cruise called Demo-1. The spacecraft arrived at the orbiting lab 27 hours later, and it's scheduled to return to Earth Friday (March 8). 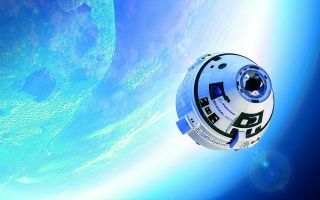 Boeing will soon fly a similar mission to the ISS, called Orbital Flight Test (OFT), with its CST-100 Starliner capsule. OFT will lift off from Florida's Cape Canaveral Air Force Station atop a United Launch Alliance (ULA) Atlas V rocket; the launch could take place as early as next month. NASA astronaut Mike Fincke monitors Boeing's Orbital Flight Test (OFT) launch simulation on Feb. 12, 2019. Fincke is assigned to Boeing's Crew Flight Test, the first crewed flight of Boeing’s CST-100 Starliner following OFT. Boeing, NASA, ULA and U.S. Department of Defense personnel recently held a dress rehearsal to help get ready for OFT launch day, whenever it may come. The Feb. 12 "integrated crew exercise" took the team through a mock countdown that featured some hiccups, as real countdowns often do. "The team was presented with simulated issues with hardware and downrange assets to exercise troubleshooting, problem resolution procedures and the coordination that goes into adjusting the countdown as necessary," NASA officials wrote in a description of the exercise. "There were even simulated challenges from the weather, forcing officials to react to changing weather conditions at the pad," the officials added. "The exercise culminated with a successful liftoff and climb into space." SpaceX and Boeing are developing their capsules under NASA commercial-crew contracts the two companies signed in 2014. SpaceX's deal is worth $2.6 billion, and Boeing's is valued at $4.2 billion. The goal, from NASA's perspective, is to bring orbital human spaceflight back to American soil — something that hasn't happened since the agency's space shuttle fleet retired in 2011. Ever since then, NASA has been dependent on Russian Soyuz rockets and spacecraft to get its astronauts to and from the ISS, at a cost, most recently, of about $80 million per seat. If all goes well with Demo-1, OFT and coming tests of the two vehicles' emergency-escape systems, crewed flight could happen soon. SpaceX aims to launch Demo-2, which will send two NASA astronauts to the ISS, in July. Boeing's version of this flight test is currently targeted for no earlier than August. Operational, contracted missions will begin sometime after the crewed demonstration flights. During operational missions, both Crew Dragon and Starliner will carry four people — one more than the Soyuz can hold.